purchase one of these certificates and give the gift of beautiful, distinctive art. each 4" x 5-1/2" certificate is produced with the same flawless print quality and on the same heavy-weight fine art paper as our Giclees. each certificate is custom printed upon receipt of your order. 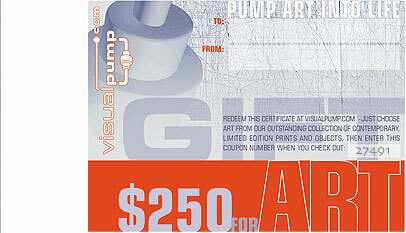 The recipient can redeem the certificate's value by simply choosing a work (or works) of art, then entering the number printed in the lower right corner (when prompted) during the check-out process. The certificate value will then be deducted from the total. If the total is higher than the Gift Certificate amount, the balance may be covered with an additional payment.